Canese K. PubMed Filters Sidebar Replaces the Limits Page. NLM Tech Bull. 2012 May-Jun;(386):e3. In order to provide users with a more visible and accessible way to narrow PubMed results, the Limits page will be replaced by a results filter sidebar. The filter sidebar options will work the same way as the limit selections; that is, once a filter is selected it will be activated for subsequent searches until the selection is cleared (see Figure 1). 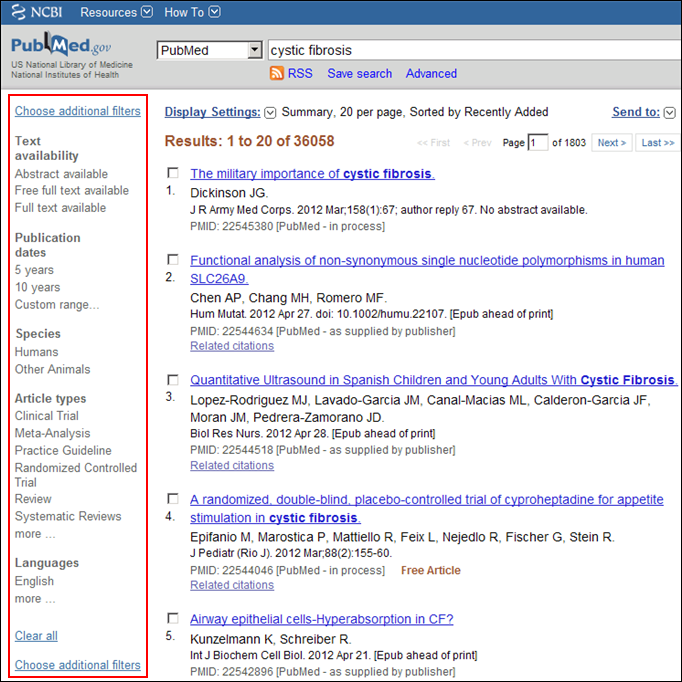 Figure 1: PubMed results with default filter sidebar options. 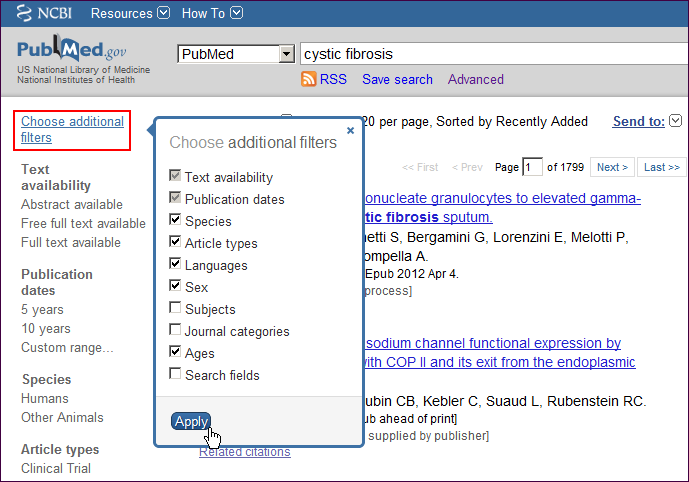 Click a filter to narrow your search results, e.g., you may filter your search results for cystic fibrosis to Clinical Trial and articles published in the last 10 years. A "Filters activated" message will display on the result page (see Figure 2). Only valid filter options for a result set will display on the sidebar, e.g., Meta-Analysis was removed from the filter list in the search above because none of the result citations were tagged with that article type. To turn off filters, click either the “Clear all” link to remove all the filters, the “clear” link next to a filter category to clear the selections within that category, or the individual filter. To add additional filter categories to the sidebar, click the “Choose additional filters” link, select the additional categories, and then click Apply (see Figure 3). To add filters to the sidebar for categories with many selections, click the category “more …” link, select the additional filters, and then click Apply (see Figure 4). 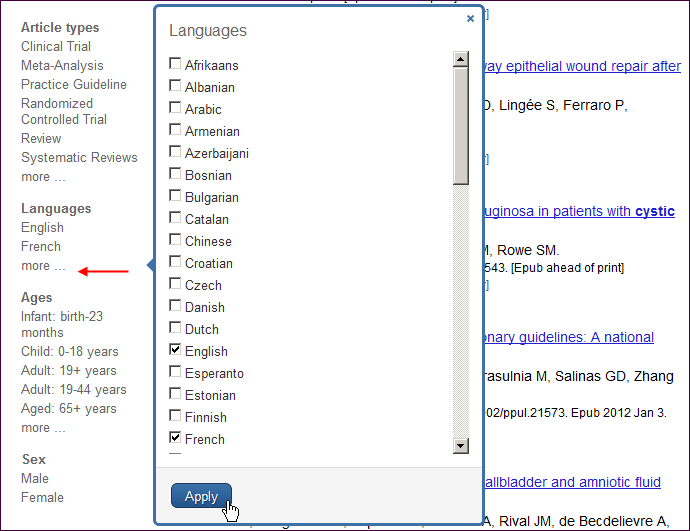 Figure 4: Filters sidebar category “more …” pop-up selection box with languages selected. 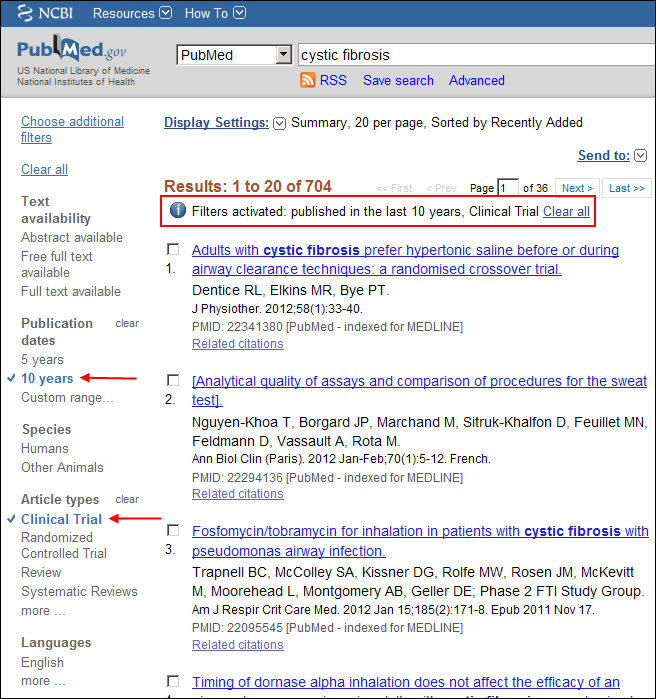 The PubMed default Review and Free full text filters have been moved to the filters sidebar. The “Filter your results” portlet will eventually be incorporated into the filters sidebar. ISSN 2161-2986 (Online) Content not copyrighted; freely reproducible.